Wordpress ecommerce theme ~ Flexible wp shop theme! →WordPress ecommerce theme ~ Most Flexible WP theme for your online shop! What’s very attractive with this ecommerce theme by MyThemeShop is its flexibility and scalability. If you want to succeed in your online business, you need a theme that’s build with business growth and expansion at the focus. Flexible, user-friendly back-end content management. It’s a pure waste to purchase an ecommerce script that does not offer you the back-end simplicity to quickly figure out and easily set up your shop. Ease of payment system integration. Recruitment and management of Affiliate marketers. Search engine traffic is generally the best source of traffic that converts. People, with money in their pockets are surely searching to buy your products. If your ecommerce wordpress theme is not SEO friendly, you may be missing a lot on this lucrative traffic channel. e-commerce theme customer service and updates. Customer service is the backbone of any business. If the shop script you purchase does not have a responsive and high-rated customer service, your business may one day collapse due to lack of required customer support service. Your business must aim at growth. But the question is, does your ecommerce theme allow you to implement the growth online? You may want to expand on product categories, geo-targeting, etc. If your script does not have room for online growth, you are surely in for the wrong choice. Frontend user-friendliness and shop beauty. One of the factors that keep visitor browsing your shop is the beauty and aesthetics of your shop. While a very beautiful shop does not guarantee sales, a poor quality shop can turn your customers away. You must pay attention to how well your script creates product image thumbnails and how pictures and product features are presented for the ease of accessibility. If your buyers find it hard to add/remove products from the cart, your wordpress shopping cart may break your business if not properly chosen. Ease of creating promotions and special offers. Every business that succeeds has moments of promotions and special offers. This is common during holidays and special events. Your Wordpress ecommerce theme or any shopping script you use should allow you the flexibility to create special coupons and brandish them on the forefront to attract more sales. Most Internet users are now on mobile so it will be a huge mistake to invest in an ecommerce wp theme that’s not responsive. Ok, now let’s see a bit more about what I think is one of the best WordPress ecommerce themes in the market today. This theme by MythemeShop will enable you setup any form of online shop – household items, mobile phones, car accessories, software etc. The theme’s option panel allows you to practically configure your shop and start running your business without any further assistance. The developers make it simple for you to initially upload your logo and a favicon to announce your brand to any new visitors to your shop. If you simply have a unique background design, you can simply upload. However, the theme comes with a plethora of excellent and professional patterns for your shop background. Many other areas of your blog can be easily edited within the styling options page. Some of these areas include the footer section where you can conveniently select the social media buttons and payment methods to display. This is what your footer section may look like! 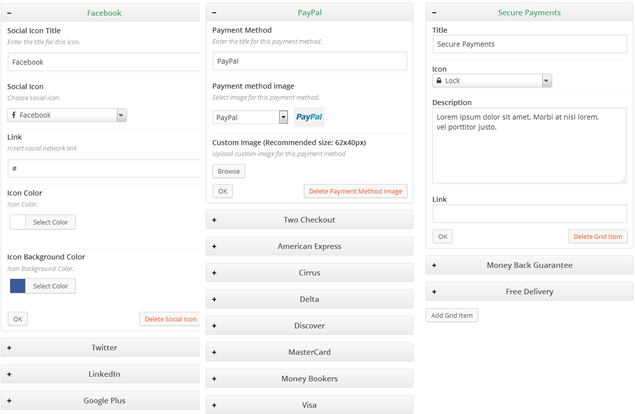 From the styling option panel, you can simply click to select which payment method shows here and which social media icon and link to display. It allows you to edit your Secure Payment, Money Back Guarantee and Free Delivery statements. It’s amazing how MythemeShop’s WordPress ecommerce theme allows you the flexibility to control your home page elements. As shop administrator, you can create enable/disable the slider on Homepage, create multiple sliders with images, catch-phrases, attractive text with links etc, change your layout, edit the welcome message and much more. MythemeShop’s ecommerce wordpress themes has full support for WooCommerce plugin. This allows you to effectively manage your shop and collect payments. With no special skills required, all you have is to select options and validate. They will instantly reflect on your shop and you are free to go. Dealing with social sharing buttons! Social sharing buttons on your shop allows your visitors and buyers to share your articles on social media. The position where your buttons appear (below, above or floating) really matters. While This ecommerce shop does not force and stick your buttons to a fix position, it gives you the flexibility to decide where to show the buttons. All you have to do is go to the social buttons section of the options panel, select the position and different social media networks to display on the tool bar. Now, you may want to monetize your shop by advertising other products or simply want to sell space on your shop with BSA. You won’t need to install any additional plugin as this theme already has an inbuilt ad management feature. All you should do i s copy and paste ad code (Adsense, BSA, etc) and select position where you want the ad to appear. Add more to your shop with ease! There is much more you can add to your shop to encourage more business. I’m thinking of features like Testimonials and customer reviews. With MyThemeShop’s WP Review Pro plugin, you are able to add an exceptionally powerful feature to your shop that will surely boost sales. The WP Review Pro plugin adds review feature to your online shop. This helps you gain more visibility on Google with reviews and rich snippets. Another extension that can boost sales is the WP Testimonials Plugin. People often don’t just buy online these days without proof of value in what they want to buy. One of the ways to speak out the worth of your product is to allow those who have used it to testify. This brings in customer testimonials. However, adding testimonials to your WordPress shop can sometimes be very tricky. To take away the difficult part, MythemeShop has developed this plugin to help you professionally add testimonials to your shop. The results, generally is an increase in trust and a boost in sales. There is all you need in this WordPress ecommerce theme to smoothly run and grow your online shop. This features page has much more details I might not have brought out here so I recommend you check out that page to make an informed decision. Let me hear what you think about the wp shop theme! MyThemeShop Themes are fully SEO optimized and and responsive, i used their themes for my three blogs. Satisfied with them and recommend their themes. The theme is very nice, it has everything an online shop needs, MyThemeShop did a great job with this WP Theme. yes bro all is inside to make sure your business grows to success. Great looking theme! e-commerce can be very tricky. Make sure you are using an SSL if you are collecting payments, even if you are using a 3rd party. Got to be secure! Any business online that has to do with collecting payment, it’s recommended to run on secured links. Such a great review. This amazing WP theme can simplify the process of creating an online store to a great extent. Theme is bundled with all feature an ecommerce website must posses like easy payment integration and content management. Well, Thanks for introducing this theme to us. Its good to know about it. If this is my first time reading your blog or knowing you, I would have say maybe you’re a sales rep of Mythemeshop, this review is right on it, Man! You make this review one of a kind, and very tempting to go for this theme if I had wanted to start an eCommerce site. Theme is feature packed I must say. It will be so difficult to see other developers of an eCommerce theme come to beat this one. Thanks for your review, is such a better one. Thanks these words that boost my courage. It just occurred to me to write on something I found so great. I have read many great reviews post from may bloggers, and yours is one of those best posts hat I ever read. This is really a wonderful theme for eCommerce business. This ecommerce theme looks like the perfect theme for a growing online enterprise. This is really a very awesome review. Mythemeshop has a wide range of beautiful wordpress themes for any type of website, i already have one of their themes and its really amazing. I’m sure that ecommerce website owners will find this theme very useful judging by your review. Yes bro these guys are pros in developing exceptionally good themes. That’s a very comprehensive review! I don’t have plans to open an e-commerce site at the moment, but if I had, based on your review, I know exactly what I would choose. I already know WooThemes from a previous use and I found them reliable and easy to use, so I’m sure their ecommerce theme will be of the same high quality. Good to know you had fun. Yes, this theme is quite impressive. The features are complete for any successful online shop. It helps eliminate the use of some plugins. Will be good to know if you have any use for it in the future. Do have a wonderful new week ahead. Every time I see a new theme, I think like wow!. There are many themes, but few are there with amazing quality like mobile friendly, fully optimized and much more. You have explained about the theme in a detailed way. I am sure people will love to use this theme. Ravi Chahar recently posted…How To Add An Image In WordPress Sidebar Without Plugin? I recently started an online wordpress theme shop, I’ll check the theme to check if I can use it there. Though am not into shopping/e-commerce blog but I like the theme and would recommend this post for a friend. I would also share to help some in need of good e-commerce theme. Great review on wordpress ecommerce theme! Yes, mythemeshop offers very highly responsible themes. And all features are very impressive. Anyway, thanks a lot for sharing this post with us. My Search Stops Here !! This is one of the real winning themes out there. Fab review and fab post. I am set on the theme side of things but if I changed my mind I’d look toward this bad boy to get things rolling. Presentation counts for so much, even if some bloggers feel otherwise. Thanks so much. This is review about this theme is awesome. I enjoy reading your blog post. It’s a really good review for ecommerce template for wordpress from wp shop. I haven’t use any ecommerce before, but I will take a look into these templates when I need. Man you made my day. This theme looks gorgeous, I need to buy an ecommerce theme for a wordpress site and was considering the Flatsome Theme but this definetively looks better to me. Very nice review! My Theme Shop makes one of the very best themes available in the market today…I once had course to use one of the numerous themes provided by the company for blogs and I really enjoyed it. In the future, I’ll gladly remember this post when I think eCommerce or need to shop for eCommerce themes for a client. Do make the day great… the review was indepth, awesome and straight to the point. No doubt, My theme shop is really great theme collection website, and you described it’s all feature. Thanks enstinemuki for sharing such great information with us. Very important points for CMS and they’re helpful for Fresher that how to write a useful or efficient article, thanks for sharing and enjoyed to reading this article too much. Thanks for sharing a detailed and comprehensive review about this WordPress theme for e commerce websites. You have indeed explained each and everything about the theme in a detailed way. I am sure people will love to use this theme. Its good to know about it. Hi, Thanks for letting us know some nice themes. They are good. easy payment integration could be on any kind of payment gateways? E-commerce website. And also WP provide affordable budget to create a Business Website, and money goes to high according to your customization level of website. It looks like a great theme, I’ll keep it in mind if anyone ever asks me about shop-based themes. Thanks For Your This Awesome Information About Responsive Web Design It Really Helpful For Me In My Website Projects. Thanks for sharing this awesome post. I always love to use MyThemeShop theme to build my personal blog, my clients corporate and ecommerce site. Because it’s easy to customize and the admin panel is user friendly. Great theme!! With lot of features. WordPress is easy manageable, lots of servicess in wordpress made it more attractive and useful. Thanks for sharing the article. Enjoyed your wp shop template. i have been looking for this. Thanks. The theme looks responsive and fully seo optimized. looking forward for this. Undoubtedly WordPress is the boss of all CMS available today. Although it’s popular blogging platform but eCommerce site with plugin like woo commerce are very much attractive. Your review is great and have lot of features. Thanks for sharing. They way you presented by adding and pointing images was awesome. E-Commerce now a days become so popular and effective for business startups. With proper implementation of this will be great in future.